Project supported by ECORYS UK and the Lifelong Learning programme (Now Erasmus+) of the European Union. Overall, the experience that Everything is Possible gave me has helped me to understand better where my strengths and weaknesses lie – for example I think I would prefer and be better at teaching adults rather than children. It has given me the opportunity to teach English which is something I’m considering doing in future and has enabled me to learn a foreign language and has improved my confidence in many ways. “I’m coming to the end of my Leonardo project in Portugal, I’ve been here for almost five months and it’s flown by! My host project is Qualify para Incluir (Qualify to Include) in the city of Porto in the north of Portugal and I was lucky to be placed in a beautiful house close to my workplace and with some lovely people who have since become good friends of mine. At the beginning of my placement I taught a couple of English lessons every week to the children who go to Qualificar para Incluir to receive after-school support, it was also my responsibility to plan and prepare the content of the lessons, trying to incorporate games and interactive activities. This was an interesting and challenging experience and sometimes the lessons went really well, other times they didn’t! After a couple of months the English lessons stopped and I started helping the children with English homework when they came for after-school support. Other activities that I have done have included translating (or attempting to!) the organization’s website into English in order to be able to create campaigns to raise funds for the organization. I am currently preparing a campaign to try and raise money for the theatre activities that QPI has. In terms of what I’ve been up to outside of my work, I’ve been trying hard to learn Portuguese, going to a Portuguese speaking evening at a café in the city, I took a course in making cosmetic products (face/body creams) out of natural ingredients which was really interesting, I travelled around Portugal with my flatmates and have been trying to get to know the place and the culture better. For the first few months communicating was difficult but now I feel a lot more comfortable with the language and with life here and am really enjoying my experience here. 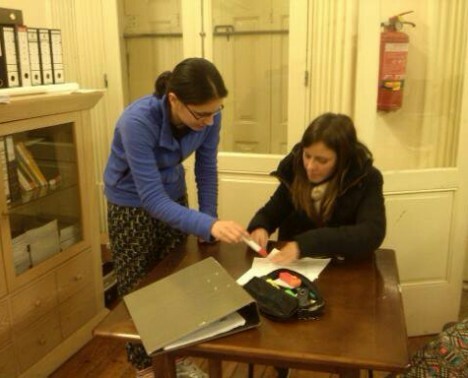 Amy Assadi, Leonardo Da Vinci Mobility trainee.